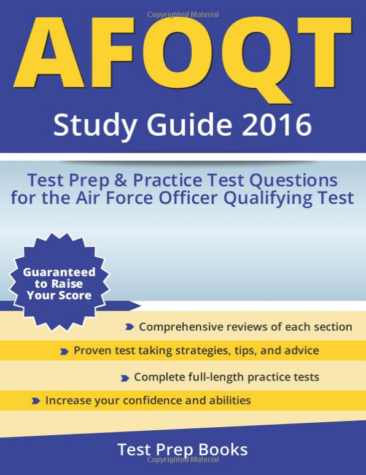 The Air Force Officer Qualification Test is a test that all prospective officers must take and submit with their application. For enlisted applicants you’ll schedule the test through your local education office, and for civilians your recruiter will schedule you to take it at the Military Entrance Processing Station or MEPS. There are other web sites that focus solely on information about the test, so I will simply link to them and provide whatever tips I believe would be helpful. AFOQTguide.com – Study guides and a couple of practice tests. I think the practice tests on this site are a little easier than the actual AFOQT test. Peterson’s – In my opinion, these practice tests are slightly more difficult than the actual test. WantsCheck – General tips and specifically more info about the pilot sections. KhanAcademy – If you need to brush up on your math knowledge, this is a great place to do it. There are quite a few printed study guides available, here are some on Amazon. I don’t have any recommendations for which is best, I got all of them I could and took the best from each, and most importantly, a lot of practice tests. Study what you’re weak in. If you are weak in the word knowledge section, there are also some books written for the GRE that cover the same type of test that you may find helpful. Check your local library as well, they may have a few AFOQT guides that you can get for free. Take studying for this test seriously. You can only take it twice in your life, and the scores have a big impact on whether you’re selected or not. For instance if you have a lower GPA, you need a higher AFOQT score in order to be eligible to apply for a GPA waiver. The higher the score, the more appealing you are to the board as well. The most difficult part for me was the speed of the test. It’s not overly difficult, but you have a very short amount of time to do everything. If you are rusty at math like I was, focus on doing things quickly once you have an understanding of how to do it. Find shortcuts online to do simple math problems quickly. You’ll need the extra seconds. When you take practice tests, make sure to time yourself. The math isn’t overly complicated, but you’ll have a very short amount of time to do each problem, so if you don’t practice under the pressure of the clock, you will probably do poorly on the real thing. If you are almost out of time, fill in all of the bubbles on the sheet randomly, you aren’t penalized for guessing wrong. If you get stuck on any question for too long, skip it and come back to it if you have time. If you spend two minutes on one question, that could have been several easier questions that you now miss.